Please enjoy this brief history and description of the Rally concept and your options when planning to sail from the US to the Caribbean in the fall. We hope it will help you decide what is best for you, your boat and your crew. I was first introduced to the rally concept in Jimmy Cornell's 1992 America 500 Rally from Spain to the Bahamas. I have also sailed in the 1998 Caribbean 1500, the 2014 ARC, and three ARC USA from BVI to Bermuda in 2015, 2016, and 2017. The idea is similar to voyaging caravans of old where groups of mearchants, pilgrims and travelers, journeyed together, usually for mutual protection, in deserts and other hostile environments. Modern ocean crossing caravans are not linked physically by tethers and nose rings, but rather electronically via satellite phones and tracking devices with two-way e-mail capabilities. The modern-day rally organizers chose the optimum season and safest routes for their wards. They can often help tame the vagaries and bureaucratic red tape and lobby the local merchants and tourist boards to roll out the welcome mat. The rally organizers provide the departure date that spurs the timely whittling of the boat's to-do list. The auspices of the rally ignite and foster the camaraderie that is the real reason to join a rally. Do not join a rally thinking you are joining for the safety aspect of sailing in numbers. This false sense of security will get you in trouble. The required list of safety equipment and hoops to jump through to join a rally differ from exhaustive to simply due diligence. While all rallies employ weather routers, it is the individual boat owner's/captain's decision to depart based on their confidence in their boat and the experience of the crew they have assembled. When should you depart from the US East Coast to the Caribbean? Every fall hundreds of boats depart the US East Coast for the warmer climates. Hurricane season officially ends November 30th. In November there is less chance that tropical depressions will make their way north, but the regular progression of winter gales every third or fourth day have arrived. Start too early and you can be forced to find shelter in the path of a hurricane. Depart too late and risk losing a gale-free weather window. John Kretschmer, who has sailed to Bermuda 25 times, states in his new book "Sailing to the Edge of Time"; "I have made this passage many times and have determined that leaving earlier, in late October, is better than leaving in November. The weather is less volatile and the chance of encountering gales is reduced. Indeed, there should not even be a question about this strategy. However most boats, including the armada of sailboats leaving New England and the Chesapeake Bay every year bound south, usually wait until November to shove off. Why? Because their insurance policies dictate when and where they can sail and still be covered." The last few years the NARC Rally has departed the last weekend in October rather than after November 1st for the simple reason that if you have a one to six-day weather delay, which we have experienced several times in the last 19 years, then you are getting too close to arriving after the Thanksgiving Day Holiday. This is not a problem until crew start worrying about getting home late and cancel on you. The biggest decision, where you depart from, may be based on your circumstances. If you are living on your boat, as opposed to waiting in a warm home until you depart, you may not want to wait north because it is too cold. Many live-aboards, and people starting their sabbatical afloat, want to be in the Chesapeake Bay by late in September and October. They can attend the Annapolis Boat Show before sailing down the bay for the trip offshore to the Bahamas, the Caribbean or choose the ICW. This makes sense and is the main reason why boats head south early to wait the end of the storm season. It is one reason why the NARC Rally has started to offer a departure from the Bay. Where should you depart from? Should you stop in Bermuda? The trip from the East Coast of the US to the Caribbean is about 1,500 miles if you leave anywhere from Maine to the Chesapeake Bay. The passage is world famous for being one of the toughest passages in the world because of the Gulf Stream. The warm water river has conjured real and imagined challenges for intrepid crews for centuries. The further north you depart from is also further east. Since the Trade Winds below Bermuda blow mostly from the east and southeast you do not want to give up easting by departing from further south. If you are sailing from New England or the Middle Atlantic States, there is a lobby that says it makes more sense to depart from Newport and make a stop in Bermuda. Newport is 200 miles further east than the Chesapeake Bay which in turn is 200 miles further east than Fort Lauderdale. Miles that you need to make up, most often, to weather. This is why they call the passage from Florida to the Caribbean the "Thorny Passage". There is a saying for boats that start further south; "Sail east until the butter melts and then turn south". The trade winds blow from the east to southeast starting just below Bermuda, so when sailing from the Bay area you would pick a way-point just below Bermuda and then turn south. (When that butter melts because it is hot from the trade winds.) Then beam to broad-reach all the way down to the Caribbean. Back in the days of sail, you could not fill your deck with jerry cans and motor-sail your way upwind from the Chesapeake Bay to the Caribbean. You had to sail east first. God placed Bermuda where he did for sailors heading north and south. It is a sin not to stop. Skippers who do not plan to stop in Bermuda do so for the following reasons. They are afraid to lose crew - Bad or inexperienced skippers fear getting stuck in Bermuda because they have not treated their crew well or they did not choose the right crew to begin with. Sometimes the first leg scares the daylights out of them and a stop in Bermuda gives them time to mutiny. Each year we see boats in Bermuda looking for replacement crew on very short notice. Time factor - Delivery skippers may be short on time. They can sail close to Bermuda and make a decision based on fuel consumption and repair list to bypass Bermuda or stop. Money - Bermuda is an expensive place to eat and drink. The head tax of $35 pp is a lot if you have a big crew. Joining an official Rally waives the head tax. Bermuda is a beautiful manicured island that is worth seeing. Sage advice departing from Chesapeake Bay or Beaufort NC is to sail east until about 30 degrees north and 65 degrees west. Then turn south. This is often called route I-65 south. This strategy often brings you close to Bermuda and leaves the option to stop for fuel or repairs. If you do not need to stop you can head due south when you are on the same longitude as your Caribbean destination. Even when you depart from Bermuda you want to try and get some easting in early so you have some miles "in the bank", so that when you get to the trade winds anywhere between 27 and 23 degrees you can sail on a reach down to your Caribbean destination with wind just aft of beam for some great sailing. Each fall hundreds of boats complete long offshore passages to get to warmer climates in the Caribbean. The first modern day rally, the ARC Rally (Atlantic Rally for Cruisers) was organized by UK based Jimmy Cornell in 1986. It has always departed from Las Palmas Gran Canarias and crossed the Atlantic to the Caribbean, presently finishing in St. Lucia. Why are there three rallies departing from the Chesapeake Bay? The Caribbean 1500 organized by Steve Black in 1990 originally departed from Newport RI, stopped in Bermuda, and then ended in different islands in the BVI. Early on, the final destination in the BVI's shifted between Village Cay, Spanish Town and finally Nanny Cay Tortola as marinas bid to have the business early in the season. Hank participated as skipper of a Swan 48 in 1998 and finished in Virgin Gorda. He was one of five skippers moving a fleet of five Swan Charter boats. The Swans had paid "charter guests" aboard and the lead delivery skipper entered the five boats in the Caribbean 1500 Rally to make it more fun for the crews. Steve admitted he did not get a lot of support in Newport and moved the start to Norfolk soon after and ended his experiment with two departure ports. Steve moved south and dropped the Newport start of the Caribbean 1500. By 2000 Steve was getting 60 or more boats in his then branded "West Marine" Caribbean 1500 Rally. In 2000 Hank Schmitt took over the Swan Program moving up to ten Swans annually from Newport RI to the French side of St. Martin. Since he was introduced to the Rally concept in 1992 he decided to invite private boat owners and other delivery skippers to join him in a new rally. Steve had dropped Newport, an obvious starting port for boats sailing south in the fall, so why not pick up the slack? When it was time to think of a name for the rally Hank came up with the NARC Rally. In Europe the NARC Rally is known as "Not the ARC" for those that dislike Jimmy Cornell or hate the idea of rallies taking over a port. Thus the NARC (North American Rally to the Caribbean) started in 2000. Hank has known Andrew Bishop and Jeremy Wyatt, two of the three principals of World Cruising Club since 1992. He admits he came up with the NARC name to poke fun at the supercilious air permeating the WCC hierarchy. Andrew and Jeremy bought the World Cruising Club from Chay Blyth who bought the company from Jimmy Cornell. Andrew and Jeremy worked for Jimmy in 1992 when Hank sailed in the America 500 rally. Andrew had a falling out with Jimmy so he and Jeremy stared Epic Ventures in the UK and ran rallies in Europe for a few years. Chay bought the WCC from Jimmy and was smart enough to hire Andrew and Jeremy to run the rally part of the organization while Chay concentrated on the BT Challenge part of the business. When Chay decided to sell, Andrew and Jeremy were the perfect couple to take over and have done an excellent job of continuing the ARC Rallies that Jimmy Cornell started and built to ignite the dreams of many a sailor. New in 2018 the NARC Fleet offered a departure from the Chesapeake Bay with an official stop in Bermuda. Both the Newport and Bay NARC fleets plan to try to depart at the same time weather permitting. In Newport, after a cold front passes through, winds are generally from the northwest to north which takes the fleet south and southeast for their first waypoint to enter the Gulf Stream. The Stream takes the fleet east and when they encounter southwest trade winds after crossing the steam start broad reaching to Bermuda. The Chesapeake Bay Fleet crosses the stream the first day out and should also be able to ride the northwest or southwest trade winds to Bermuda. It is possible to get a very good and reliable four or five day weather window to get to Bermuda, but it is hard to get a good reliable seven to ten day weather window to sail straight all the way to the Caribbean. By making a stop in Bermuda for a rest stop and to top off on fuel, you break up the passage and can wait for the next weather window. You will have a much better wind angle to get you to your Caribbean destination keeping the wind aft of the beam the entire way. Hank has made the passage from Newport to the Caribbean every year since 1998 and only once has he had a weather delay leaving from Bermuda. Bermuda has perfect temperature in November and is a very pleasant place to visit. There is a large free anchorage and they waive the $35 pp head tax for official rally entrants. Why did Hank Schmitt add a Chesapeake Bay NARC Start? Little Creek is hours closer to the open ocean than Hampton Roads (SDR start) or Portsmouth (Caribbean 1500) start. Leave from a full service marina with a travel lift. Very close to a big super market and fuel dock. Little Creek is the official Customs entry port upon return. Helpful for foreign flagged vessels. Since the fleet departs much closer to the exit of the bay they will benefit from a full day of daylight for the crew to get settled in. Other rallies start miles up the bay in Hampton Roads and Portsmouth. It is nice to be well clear of land before nightfall the first night. Departing less than an hour from the Chesapeake Bay Bridge-Tunnel has you well clear of land by nightfall the first night. The distance from Newport to Bermuda and Little Creek to Bermuda is about the same. Another advantage of making a stop in Bermuda is that you can get a pretty reliable four to five- day weather window, but it is hard to get an accurate seven to ten day weather window which is what the direct route from the Chesapeake to the Caribbean will take. One advantage to the southern departure is you will be across the Gulf Stream in the first 24 hours so can plan a sprint across to get that "monkey off your back" early on. Don Street is often quoted as saying it is safer to depart from the Chesapeake Bay than Newport for this reason. But you have to remember that besides being a sailor and raconteur, his main job is working for the insurance industry. Actuarially, by insurance company experts, it may be less damaging to the boat, but not the crew, who have to endure an upwind motor sail to the Caribbean. If you want to sail and enjoy the passage follow the historical sailing route. Past history has proven that even this strategy of the Chesapeake Bay start is not foolproof when several boats in the Salty Dawg Rally called for help the first 24 hours after departure in 2013. How did Salty Dogs morph into the Salty Dawg Rally in 2010? By 2010 Steve Black was looking to retire. The World Cruising Club bought the Caribbean 1500 from Steve Back and kept the name but changed the format to match their other popular Rallies, the ARC and World ARC. Steve stayed on to foster a smooth transition and again sailed with the fleet as he had done every year since its inception on his own boat or with a skipper who needed a more experienced hand aboard. Steve Black, West Marine and George Day at Blue Water Sailing magazine all helped build the Caribbean 1500 into the success that it has become. When the WCC Club bought the rally from Steve, word was that they were not going to change much, but rather just integrate it into its world consolidation of the rally concept into an annual around the world rally conglomerate. However, they did sign an exclusive media contract for the event with Sail Magazine, mirroring their playbook in the UK, namely being bedfellows with the British # 1 sailing trade magazine Yachting World. The WCC also did away with Steve Black's "Mr. nice-guy discounts" for repeat-participants. They also required participating rally boats to adhere to a more stringent safety inspection and list of minimum safety equipment, a new list matching requirements for boats sailing in one of their around the world rallies. All of a sudden, with a larger entry fee and new list of safety gear, it became very expensive to participate in the Caribbean 1500. Remember the exclusive media deal with Sail? Hank knew George Day at Blue Water Sailing was not happy. George was a huge part of the success of the Caribbean 1500 complete with full-page, inside back cover ads and help with seminars. In exchange George got lots of editorial for his magazine about blue water sailing. A good fit for both Steve and George. So Hank put # 1 and # 2 together by introducing Bill and Linda to George Day. The next month's editorial in BWS magazine was about a cruising couple who had this great idea to start a rally from Norfolk to the BVI. The new Salty Dog Rally was born and the battle between the two competing rallies commenced. The new rally would assemble and start from the neighboring marina next to the Caribbean 1500 in Hampton Roads and arrive in the BVI at Nanny Cay Tortola. (The Caribbean 1500 would later move upriver to Portsmouth Virginia to escape the wrath of the SDR). To answer the Question how did the Salty Dog Rally become the Salty Dawg Rally? The WCC got word that the upstart American colonists were up in arms and going to rebel with their own rally called the Salty Dog Rally. (Background: Steve Black bestowed the Salty Dog honorarium to those who had completed seven or more Caribbean 1500 rallies. Bill and Linda are in a picture with Steve Black and others commemorating the order of the Salty Dogs.) So the WCC went and bought the web domain Salty Dog Rally in a silly effort to derail the rebellion. Not a problem said Bill and Linda. Thus the new spelling. Hilarious but true. Not so funny for Steve Black who passed away in 2014 months before the 25th anniversary. "Black was devastated at hearing of a competing rally organization springing up just as the transition took place—he took the news very personally—and he worked hard, despite his retirement, to support the ongoing 1500. In the first two years the new rally succeeded in enticing many of the veteran Caribbean 1500 fleet as well as first time ralliers to abandon the Caribbean 1500 and join them. The new Rally was getting too big to finish in Nanny Cay at the same time. The personnel at Nanny Cay Marina were also getting tired of the demands of two competing rallies. Remember both the WCC management and Nanny Cay have British roots so it was natural for the established rally to stay at Nanny Cay. At the Newport Boat Show Hank Schmitt introduced Linda and Bill to John Glynn over at the Bitter End Resort booth. Almost everyone knows John Glynn since he has been the boat show and marketing face of the Bitter End Resort for so many years. John and the Bitter End Resort had just lost their participation in the BVI Festival. John was looking to replace the lost business. With Hank's introduction John invited the SDR to finish their rally in North Sound BVI and offered free moorings to start the Bitter End season. It was a good fit for the Bitter End and the SDR and separated the warring rallies. This worked out very well until Irma destroyed the Bitter End and the SDR changed final destination to Antigua in 2017. In 2018 they had multiple final destination ports. Hank Schmitt has delivered boats from the Chesapeake Bay to the Caribbean three times. All three times he sailed mostly east the first three or four days. If you do not get east early you will have headwinds the last few days, even more so the further east your landfall is in the Caribbean. With the Salty Dawg Fleet offering a final destination in Antigua after Irma, this is even more imperative as Antigua is one of the eastern most Leeward Islands. Rick Palm, the Director of Rally Management, explained about the most recent rally (2018); "The fleet split as it headed offshore and found steady southeasterly headwinds for the course to the Caribbean. The Bahama bound boats had a good fast ride southward in blustery conditions and fetched up in Marsh Harbour, the Abacos after passages that ran from four to six days. For the Caribbean bound boats, several opted to sail to Bermuda instead of bashing into the headwinds." A study of the Pilot Charts for this time of year will confirm more headwinds the further south you depart. For the 10th anniversary of the NARC Rally, organizer Hank Schmitt made the rally free with no entry fee. Rally participants still get discounted or free dockage, a shared weather router, socials and tracking with spot/garmen trackers. There is a per head fee to cover several meals and socials. The NARC Rally is geared more towards larger boats and professional and experienced crews making the annual migration south. However experienced private boat owners are welcome to join the Newport departure to Bermuda. 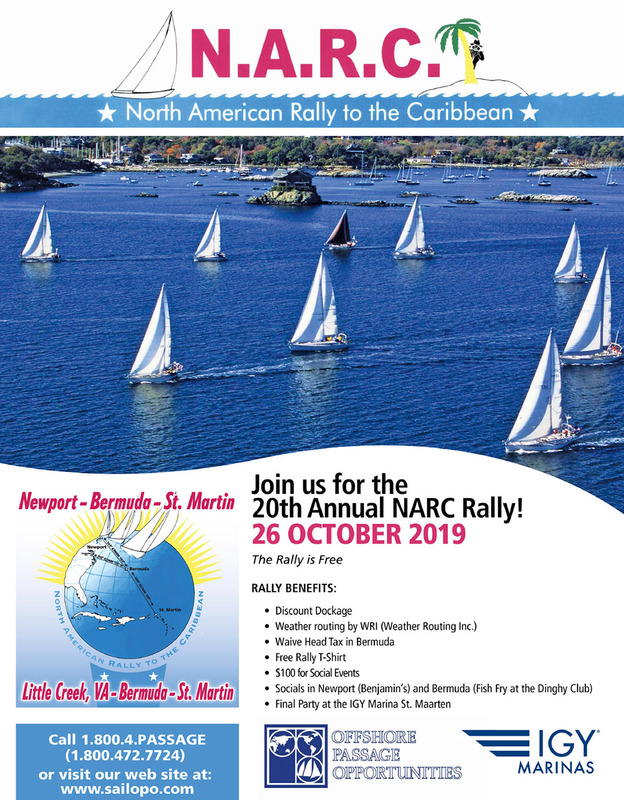 Smaller boats or boats that wish to sail south sooner can depart from Little Creek and join the other NARC Rally boats in Bermuda before sailing to the Caribbean. The Salty Dawg Rally started with a similar free rally concept. More recently they formed a 501c tax- free foundation based on boater education. Any sailor can attend their seminars. There is now a fee to join the Salty Dawg Association. They are run by a volunteer board. Go to their web site to see their fee structure and what they offer. Things have changed since the 2017 storm season. This free/volunteer "American Rally Model" has cut participation in the British owned Caribbean 1500 rally that needs to support a paid staff with transportation, accommodations, and salaries. They also try and make a profit; after all they are a business. The last two years they have had less than 30 boats in their fleet. Five years ago they had 80 boats. The free rallies expect owners/captains to have their boats prepared and safely equipped for a ten day offshore passage in the fall. The Caribbean 1500 requires a more detailed list of safety equipment that would be found on a boat making a circumnavigation. This makes sense since they are trying to get American boats that sail in the Caribbean 1500 to then join the World ARC Rally fleet passing through the Caribbean each winter. Sailing south in the fall is not to be taken lightly, and all boats should have at least one veteran offshore sailor aboard. Why would you pay lot to be in a rally? The WCC has been in business since 1986 and they have perfected the rally concept. It is not an easy business as you are trying to organize a bunch of people who may have gotten into sailing to enjoy the freedom of sailing and not to be told what to do and when to do it. The Caribbean 1500 has stringent safety requirements which might help a first timer get his boat ready. They provide binders of information and help organize your preparation and calendar. They offer seminars on several subjects the week leading up the departure, two weeks for the ARC Rally. The Salty Dawg also offers seminar. Since they are a 501c everyone is invited. The NARC Rally does not offer seminars since so many others already offer them. The WCC provides a team of paid staff, called yellow-shirts, to help you qualify for their rally and keep you on schedule and answer questions. They have a lot of influence in some ports. Jimmy Cornell was instrumental in getting the sea wall built around the marina in Las Palmas after a participant was killed falling between the dock and a boat after ferry boat wake caused him to fall in the water and be crushed to death. Getting Tourist boards and marinas to throw in free dockage and free bus tours is easy in comparison. Hank has participated in several of their rallies, but other than the America 500 in 1992, the money was not coming out of his pocket so it was easy to join. Hank Schmitt, who organizes the Annual NARC Rally (North American Rally to the Caribbean), has made the crossing to Bermuda sixty-one times, sixty by sail boat. The one time by power boat was on an 81-foot longline commercial fishing boat dropping off an injured crew. Three winters from the end of October to the end of March Hank would make 10-day Tile fishing trips setting 2000 hooks twice a day three handed. They would leave Montauk, Long Island NY right after a storm and then fish 3 days 100 to 300 miles offshore, then the next gale would arrive and they would stop fishing and ride out the storm for two days and then fish three more days before the next gale and try and beat it to the dock to make last call at the fisherman's bar called the Liar's Saloon. They did this all winter long with another crew going out for 10 days to allow rest in between. Six days of fishing out of 10 days provided a decent paycheck. The American Fleet for the Newfoundland Flotilla in 1997 sailing from New York to Newfoundland for another 500 anniversary of John Cabot's claim to North America for England. In 1999 he also organized Millennium's First Sail to be on the dateline in 2000, New Zealand for the America's Cup and Australia for the Olympics in 2000. In 2017 he organized the Rally to the Cup from five East Coast ports to Bermuda for the Americas Cup in Bermuda. Hank has spent his entire life at sea. Six years working offshore oilrigs off Newfoundland, Columbia, SA and French West Africa. He commercial fished out of Montauk, NY three winters between 1989 and 1994 on an 81 longliner similar to the one seen in the Perfect Storm. He has been a delivery skipper for over 35 years with over 250,000 miles with 7 Atlantic crossings and over seventy-five Gulf Stream crossings.